I am developing loudspeaker enclosure. Mines are mostly multiple degree of freedom cavity resonator types. These systems are world-premier systems. You will find the most advanced features in my web site. This Blog is to take notes of daily weekly or monthly activities. I packed some of my speaker systems in order to present at conference of Research Institute for Loudspeaker Systems and Related Trchnologies (RILSRT) held on 23rd of September, 2010. 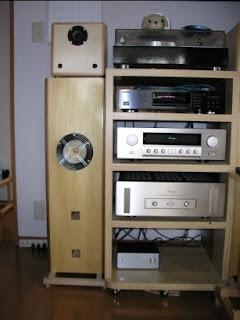 I resumed using my main loudspeaker systems that are tall 5" system in the left photograph. The main system is named TR130c. This system is equipped with Nf5Exciter full-range driver by Feastrex. I again realized completely different world with Feastrex drivers from with Fostex drivers. Listening Jazz Piano Trio ("The Ground" by Tord Gustavsen Trio: ECM 1892 B0004123-02), I felt music itself rather than just high fidelity sound. This was true to Morzart' Violin Concerto, List's Piano Concerto and all other music sources that I own. Feastrex sound is music itself. High frequency sound directly reaches to me without distortion. Nothing is annoying. Thigh I enjoy piano trio with my "CON GIOIA" system with Fostex FE83En drivers, but not as much as with "TR130c" system with Feastrex Nf5Exciter drivers. I have to realize this difference between these driver models. Much expense for some is sometimes inevitable. I should not have known Feastrex drivers. Some of details are discussed in this link. I am developing world-premier multiple degree of freedom cavity resonator (MDOF-CR) loudspeaker systems.